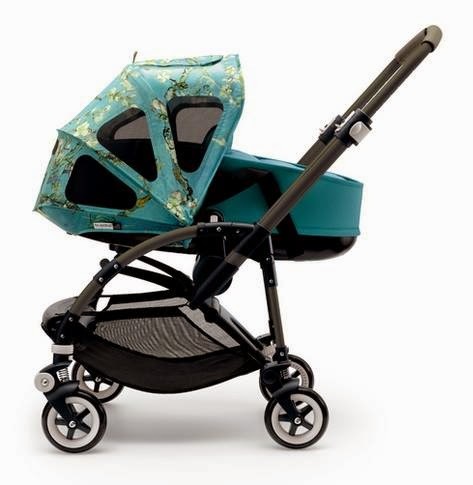 The Bugaboo website states; When Bugaboo and the Van Gogh Museum decided to collaborate on a stroller it quickly became apparent that the Almond Blossom, which represents new life and new beginnings, is the perfect fit for the Bugaboo Bee³: the urban stroller for parents who live life on the fly. The bold, dramatic brush strokes and colours that give van Gogh's work a sense of movement are a perfect fit for Bugaboo. Bugaboo has used the Almond Blossom as the muse for the Bugaboo Bee³ + Van Gogh collection: a fully equipped stroller whose components and accessories are the mobile embodiment of the Almond Blossom painting. Both the stroller’s coated green chassis and matching faux leather handle bar echo the color of the tree’s branches, while the seat fabric and bassinet are Petrol Blue, reflecting Van Gogh’s clear blue sky. 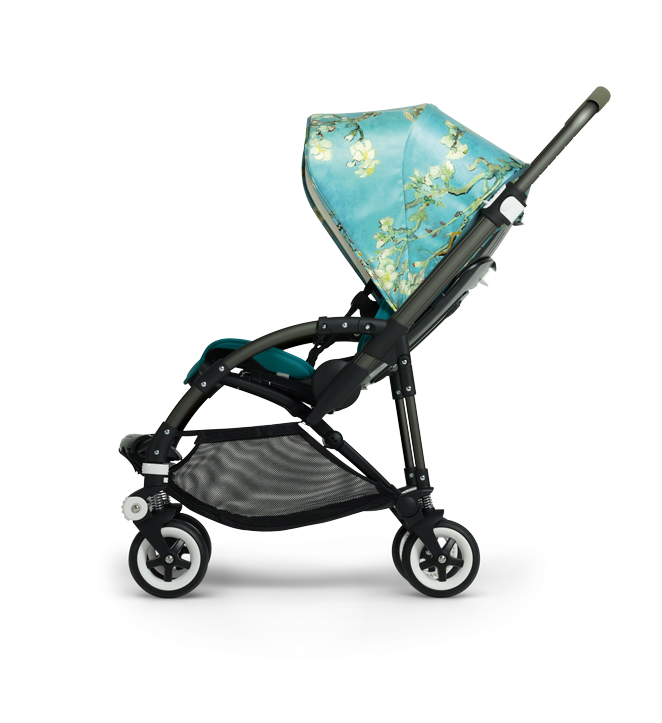 The exterior of the stroller’s silk-like sun canopy, the breezy sun canopy and the footmuff are covered in the Almond Blossom print, with a complimentary color on their undersides. The Bugaboo Bee³ + Van Gogh collection adds a touch of nature to an urban setting, breathes a hint of spring no matter what the elements, affords serenity under the starry night of a country sky. Carrycot Tailored Fabric Set Van Gogh (€120/ £110), the Bugaboo Footmuff Van Gogh (€134.95/£119.95 ) and the Bugaboo Bee³ Breezy Sun Canopy Van Gogh (€94.95/ £74.95). The Bugaboo Bee³ Complete Van Gogh with matching carrycot sells for (€989/ £869). The carrycot tailored fabric set and accessories can also be bought separately. Bringing a new colour to the Bee3 chassis adds a new element to the design and overall look of the Bee3. 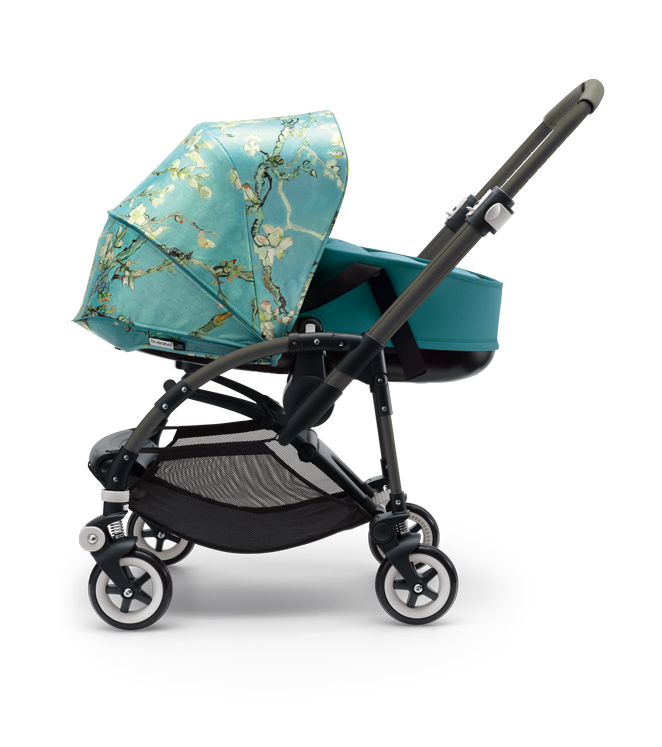 Adding a different colour element to compliment the eye catching Almond Blossom hood fabric with contrasting teal colour seat and carrycot. There will also be an Almond Blossom footmuff as shown below. 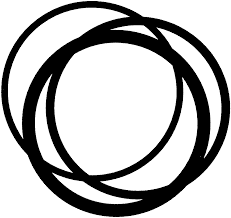 All items available from April 2015.